SATEMAKER Barbecue Etna Mini Stainless Steel - Charcoal - Inclusive BBQ Travel BagBarbecue made enti..
SATEMAKER Barbecue Etna Basic Stainless Steal - Charcoal - Inclusive BBQ Travel BagBarbecue made ent..
SATEMAKER eBBQ New York Electric L-1800WElectric barbecue made entirely from Aisi 430 stainless stee..
SATEMAKER pro 54 spiesjes 25 x 25mmSateh, Brochettes, broquetas, kebabs…! A fast and tasty solution ..
SATEMAKER BAMBOE Skewers 25cm diameter 3.0mmMaking bamboo sticks is mainly craft. Sawing, splitting,..
SATEMAKER BAMBOE Skewers 25cm diameter 2.5mmMaking bamboo sticks is mainly craft. 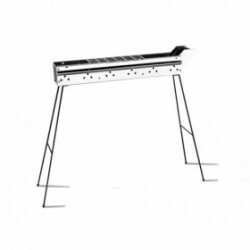 Sawing, splitting,..
SATEMAKER BEACH Portable Barbecue 50cm Inox. Many thousands of years ago, man had to travel long dis..